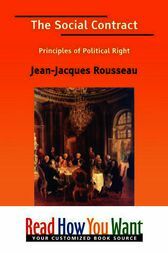 The Social Contract is one of the most important works by Rousseau. He expresses the view that in a society man has to completely rely on fellow beings with whom he is also in continuous competition. He presents the theory that people should have a right to rule themselves directly and not through representatives. Remarkable revolutionary ideas have been presented here. Thought-provoking!